We're still mostly avoiding grains for gut and allergy issues. Yet we're still eating pizza — thanks to this awesome cauliflower-based pizza crust. The first time I made it, my family asked (as always) what was for dinner. I know they were thinking it was not going to be very good. I mean how could it be? Doesn't that just sound weird? Turns out that mild-flavored cauliflower dresses and flavors up very well into a pizza crust. Quite surprisingly, if I do say so myself. (I didn't have high hopes, either, the first time.) The flavor is actually awesome, and if you make the crusts ahead of time and let them firm up, you get a really good texture. Now it's one of our favorite pizza crusts! 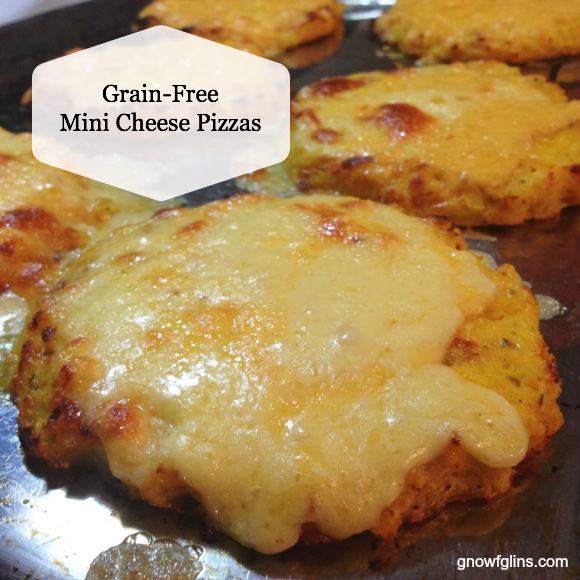 And so let me share these mini grain-free cheese pizzas with you. Cut florets off cauliflower heads. In food processor, whizz* the florets (as many as you can at a time) until the consistency of rice. Put cauliflower in stainless steel pot without anything else (no water even). Over medium heat, cook until steamed but not mushy. Remove from heat and let cool, about a half-hour. Preheat oven to 450 degrees Fahrenheit. Combine ?2 cups steamed cauliflower with 2 cups shredded cheese, eggs, oregano, garlic powder, onion powder and sea salt. Cover two baking sheets with parchment paper. For the dough, shape into about (10) 4- to 5-inch across, 1/4-inch-thick mini pizzas on the lined baking trays. Brush with olive oil. Bake for about 20 minutes or until the crusts are browned. Remove from oven and let cool to room temperature before proceeding. *Once I forgot to whizz the cauliflower before cooking it. Instead, I steamed the florets whole and then realized my mistake. Then I thought I could make it work anyway — I let them cool, and then processed them into a rice consistency. It worked fine. This means you can actually use leftover cauliflower to make a quick crust for a quiche, casserole, or pizza. Turn on the oven broiler and move a rack to near the top. Remove parchment paper from the baking trays (it is a fire hazard at this point) so the mini-crusts are directly on the baking trays. Brush each with olive oil. Sprinkle with shredded cheese. Broil in oven until cheese is bubbling and browned. Serve. These are delicious alongside grilled chicken or hamburgers. If you want to make full-size pizzas, double the crust ingredients and shape into 2 to 3 pizza crusts, bake the same way, and top as you desire. What's your favorite grain-free pizza recipe? any more recipes you create for grain free. Ok. That’s me tired after our first full day of working at picking blueberries and this looks really good……! Love you, Wardeh! Giving this a try. I was just looking through and trying to figure out how to do this so it was great timing! Do you think these crusts could be made ahead and frozen? Or that they would turn into mush? I think I might give it a try! I did it! I thawed it out in the oven to dry it out first, and then made the pizza as usual. It worked great! Totally freezable. And leftovers even taste great cold from the fridge. 🙂 yum! Okay Wardee or Nichole, so where it says this: “Combine ?2 cups steamed cauliflower with 2 cups shredded cheese” – how much cauliflower did you use? Did you just guess at it and use all the entire head? Naomi — It depends on the size of cauli. A small-medium head should give you 2 cups steamed. What I usually do is steam a few heads, and then I keep the leftover for cauliflower “rice”. Or make extra pizza crusts depending on how much cauli it is. These turned out very well! I must admit I was sceptical at first, but the pizzas were delicious! The only change I made was I put on a tomato sauce topping. Thanks for much for sharing this recipe! …only thing I change is not use olive oil with cooking-baking (palm, grape seed, coconut or sesame are better/safer choices-I think)..long ago I learned OO’s (Olive Oil) molecular structure changes with heat application and produces harmful toxins… I use lots of Olive oil just after the fact because it does have excellent nutrient properties if used properly. luv this recipe and sprinkle with nutritional yeast on occasion. Delish! Thank you. Does this crust get crispy? I made a cauliflower pizza crust once. The taste was okay – not great, but okay for grain-free. But the consistency was awful. You could pick it up – very carefully. It never got crispy or crust-like. Rebecca — It could get crispy, I think. Definitely using a baking stone and after one side bakes, flip over to bake on the other side. Then let it cool all the way before making the pizza. I don’t think it will get crispy like crackers though. Fantastic! I love it and can’t wait to try it! It looks so mouthwatering (if I may say) and it’s so healthy:) Thankyou for the recipe! How do you think these would stand up to a grill? We just discovered pizza on the grill and LOVE it. But we are trying to cut out the grain. Would these hold together enough to be grilled on each side before putting the topping(s) on? Rachael — I’m not sure these would hold up on a grill, at least not on their own. Perhaps you could do smaller size on large-ish cast iron skillets? This looks so good, I love pizza!. Why no sauce? Does tomato sauce make them too soggy? Just wondering. They sound yummy though!! Carrie — You can use tomato sauce, definitely! How important is broiling? Can I bake for that step instead? I turned my broiler on for the first time yesterday, and it flipped the breaker! So, I don’t think I’ll be broiling until we move again.. I was also wondering if you can add veges as toppings or will that make the crust soggy? After doing just about everything wrong, they still turned out pretty darn good! Tip based on my experience: I only had about half the cauliflower needed, but it’s hard to split an egg in half, so I added some coconut flour to dry it up a bit. I could taste it in the finished pizza, but it wasn’t bad; you could use something that has a less distinct taste. Sounds like you should think about selling your Grain-Free Cauliflower Mini Cheese Pizzas crusts in the stores. I’d buy it. Love all the sharing going on here. New to here, so I hope you don’t mind my sharing. I have made cauliflower pizza but with an added step that helped with the crispiness of the pizza. Put the slightly cooled cauliflower in a tea towel and squeeze the excess water out, squeeze it hard. You’ll be amazed how much water comes out. And, the recipe I use does say you can make ahead and freeze, and pull it out of the freezer and dress it, using it just like a frozen one. I haven’t personally done it but this person says she did and it worked fine. I also think you could do this on the grill on aluminum foil, but I hate using foil so could do the stone, preheated on the grill. Am I the only one here with questions about steaming without water? I’ve never heard of that! How log do you cook it? What heat setting? Won’t it stick in a dry pan? Thank you for your kind indulgence. I love your recipes.